The Minister in Office for Europe and Foreign Affairs, Ditmir Bushati, received today in a working meeting the Italian Minister of Foreign Affairs and International Cooperation Enzo Moavero Milanesi, where he expressed gratitude to Italy for the unsparing support has given to Albania to take the lead of the OSCE. Among other things, Bushati said that the time when our country will lead the OSCE will be primarily a test to implement all Albania's capacities. "We have had a close cooperation with Italy, not only in the political, but also in the human aspect. Our cooperation has been strengthened within NATO during the cooperation with you, but also within the framework of the OSCE. I want to thank the homologue that has given to Albania the opportunity to take the lead of the OSCE chairmanship, this will be a great opportunity to test our abilities. Today I want to express my gratitude for the consistent support that has been given to our country," Bushati said. "Europe is an ideal to be reformed internally and to further enhance the Albanian economy to build more democratic stability in the region," Bushati said. He also thanked the two Italian ambassadors in Albania and ours in Italy, because, as Bushati said, "as we entered in 2019, we have made very positive steps regarding the facilitation of consular procedures that will help Albanian citizens living in Italy and Italian citizens who want to live in Albania. 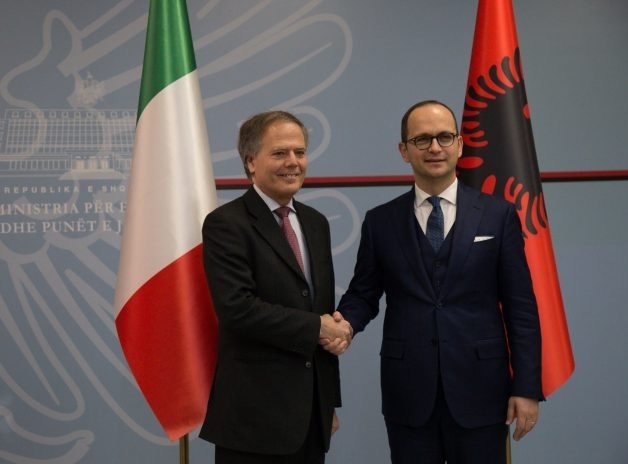 While the Minister of Foreign Affairs and the International Cooperation, Enzo Moavero Milanesi, said that the relations between Albania and Italy have deep roots in history and it is enough to recall that there are Albanian communities in Italy of hundreds of hundreds of years that have maintained their traditions, language and culture. Are these two countries of the same seas - Ionian and Adriatic - that are linked by culture and have strong economic and trade relations. He noted the common presence in important international organizations such as NATO, UN, OSCE, assessing the fact that Albania will have OSCE membership in 2020. He also noted that special attention this year will be devoted to the Central European Initiative (CEI), which since 1 January 2019 is run by Italy. He also stressed that Albania's journey towards the EU at this moment is oriented towards formalizing the opening of the deep and complicated negotiation process with the aim of Albania's accession to the European Union. Italy holds the first place for trade exchanges and as an investor in Albania. Also of great importance is the study of the Italian language in Albania, where there are about 77,000 students enrolled in Italian universities, about 10,000, which make up the largest community of foreign students.